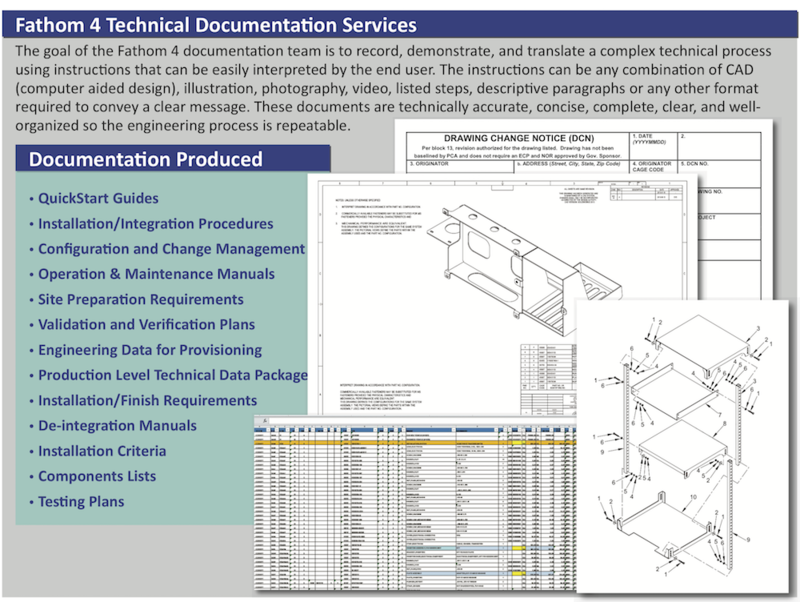 Fathom 4’s documentation team creates our technical documentation by linking the engineering prototype group and the end user. 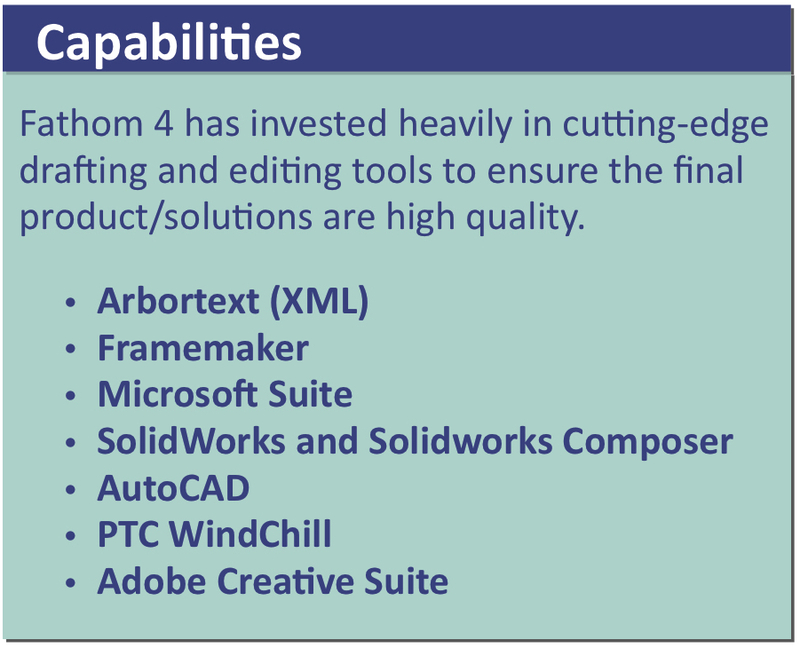 Fathom 4 employs a management philosophy of embedding drafters, illustrators and technical writers on the production floor so there is direct communication between the engineering team and those performing the work. This dynamic gives the Fathom 4 team direct access to the drafters making the drawings, the technicians performing assembly, and engineers/ program managers making decisions. This integrated team solution provides for immediate feedback to any questions that arise which improves the efficiency, accuracy, and effectiveness of the end product. Fathom 4’s documentation team is experienced in creating custom graphics and line art for optimal printing from 3D models or digital photos. The team specializes in generating exploded views for the technical documents in order to reduce the reliance on digital photography and create a clear and logical format to the installation. Specializing in C4ISR integration into military platforms, our technical documentation team is familiar with various military standards such as S1000D, MIL-STD-31000, ASME Y14.00, and Air Force and Army Interactive Electronic Technical Publication business rules. Fathom 4 has developed Linked System Manuals for Assembly, Repair and Training (LinkSMART), tying all of these different data sources together with an interface that allows the warfighter to quickly track down any item through visual refinement of clicking on images. 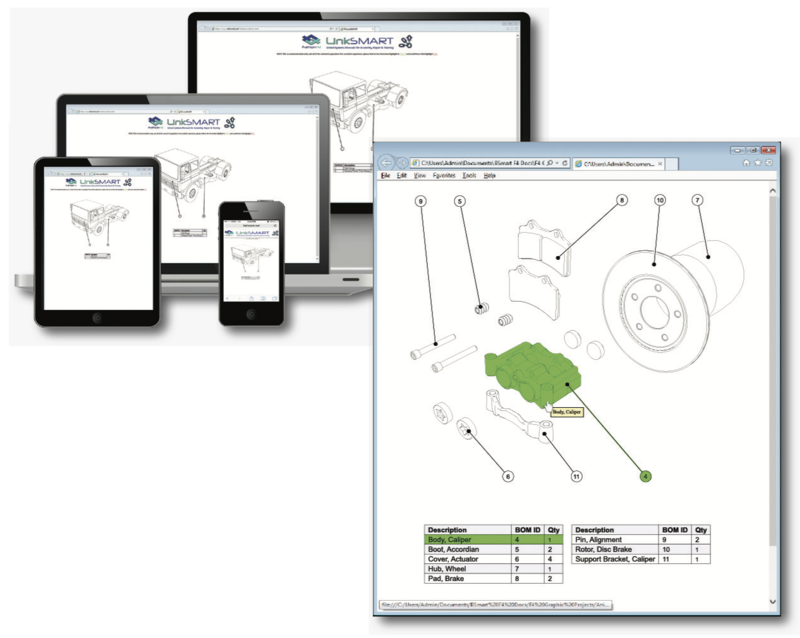 The LinkSMART system visually guides the warfighter to the proper documentation for each component.The Fathom4 LinkSMART system pinpoints user needs through lightweight images, to reduce download size from the full technical documentation package to just the specific references required. The LinkSMART system gives the end user the exact same content in the exact same file format, by enhancing the search method and providing only the files necessary, for reduced download times and data usage.